Another debut on Live and Loud! for a band requested by 1 of my listeners - in this case, 1 who has been good enough to even supply me with a recording to remaster. 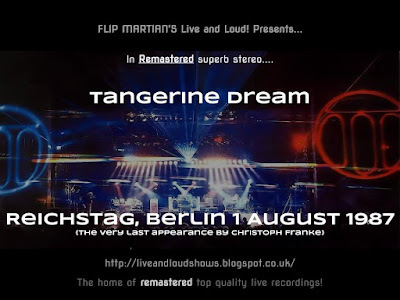 As many Tangerine Dream fans will know, for a long time there was a central hub for the trading and swapping of live bootleg recordings called the Tangerine Tree (which you can read about here). I know little about it personally, but I have had 1 particular listener bending my ear a bit to feature Tangerine Dream on Live and Loud! for a while, so I challenged him to send me something suitable and eventually he sent me this show, a free event celebrating the 750th anniversary of Berlin, held outside the Reichstag. This gig was especially notable as the last gig featuring Christoph Franke, who had been with Edgar Froese in the band since 1971. So a bit of a landmark recording in some respects. The recording, I am informed, was originally remastered for the Tangerine Tree release by Wouter Bessels. It was basically clean, although a bit flat and I did find a small drop in volume at one point, so after fixing that I spent a lot of time EQ'ing - its a long show, lasting over 2 hours so it took a while! But I think its been worth it. I'm reliably informed as a result, this now has more of a balance between the backing tracks and the live playing. Either way, it sounds pretty spectacular I think. Even if you have this recording from the Tangerine Tree originally, I hope you'll give this a listen and enjoy it. And my special thanks to Graham for the source recording (and the occasional nagging). The late 80 were not an especially great time for T-Dream, all those new digital synths sounding kinda harsh and glassy compared to the deep ambient bliss of their seventies output. But this actually sounds pretty terrific. Cheers. I've been promised a Baumann era recording to do at some point later this year, so hopefully that will be a good contrast. I have the entire Tangerine Tree series if you are interested. Thanks for the offer but I already have someone supplying me with TD material. Thanks anyway, appreciated. Hope you enjoy what I've done with it. This is just superb. I cannot believe just how good a recording this is. Great stuff. Thank you. Keep them coming!